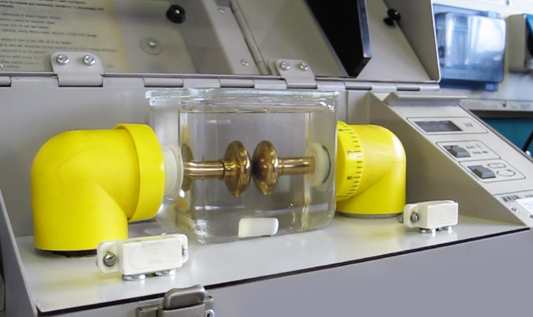 Aluchem has recently developed a specific product for transformers, denominated Unionlub DT 10, that distinguishes itself from other products present on the market due to its excellent dielectric rigidity (resistance of the fluid to electrical stress), obtainable through treatment with a specific system that operates in a vacuum. That process of treatment and purification of the product allows for reaching very low levels of contaminants, such as water, solid or other particles, thus ensuring a higher-quality product and allowing the client to be able to use it immediately, without having to treat it on site. As an example, similar untreated products have a dielectric rigidity of approximately 40 kV and a water content of approximately 30 ppm, while Unionlub DT 10 (treated product) has a final dielectric rigidity of > 60 kV and a water content 5 ppm. Clearly, the use of Unionlub DT 10 allows for both significant savings and optimization of organization. ■ Exceeds IEC 60296 specification.